Make sure the candle is safely placed on a stable surface, and light it. Place the glass, upside-down, over the top of the candle for a few seconds. Be careful though, it may get hot! What do you see on the surface of the glass? You should find that the glass goes misty and the candle will eventually go out. Candles, as you may know, are made of wax. The exact composition of the wax will depend on the type of wax used, but all candle waxes contain a lot of hydrogen and carbon atoms. 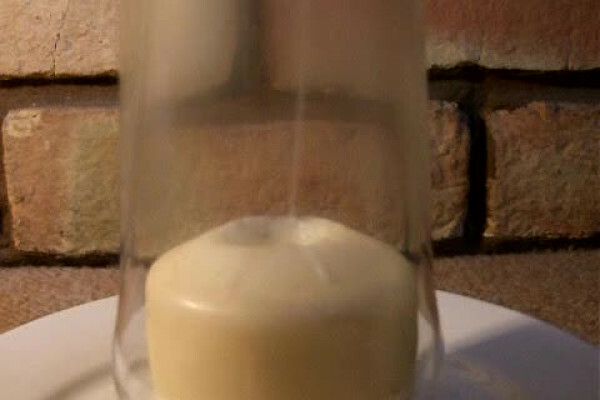 When the candle is burnt the candle wax is reacted with oxygen in the air. The carbon atoms will react to form carbon-dioxide (CO2) and the hydrogen atoms will react with oxygen to form H2O - water. When the water is formed, it is very hot and so in the form of steam or water vapour. When this water vapour meets the cold glass it condenses to form tiny water droplets, which you can see as mist on the glass. A candle flame takes in oxygen and gives out water vapour and carbon dioxide If you put something cold near the candle, like a glass, the water vapour condenses to form water droplets - making the glass look misty! Fuels like petrol and diesel are also made up of hydrogen and carbon so when your car runs, burning fuel, it is also making water. This is why you sometimes see water dripping out of a car's exhaust pipe. The candle uses up the oxygen in the glass by converting it into water and carbon-dioxide. Because the exhaust gasses (the steam and CO2) are hot they will rise to the top of the glass and fill it up from there. As the level of the exhaust gasses reaches the candle it will start to go out. The candle gives out hot exhaust gasses such as water vapour and carbon-dioxide, and uses up oxygen. When the level of oxygen at the candle drops below a critical level the candle will be put out.